This recipe for chocolate waffles is the perfect excuse to use your waffle maker for dessert. You can prepare them in a countertop electric waffle maker or old-fashioned stovetop waffle iron. The best part is, the batter can be whipped up at a moment’s notice, and in a matter of minutes, you can serve crisp and warm chocolate waffles straight from the waffle iron to the dessert plate. Melted chocolate folded into the waffle batter gives every bite rich, chocolate flavor. The recipe calls for readily available semi-sweet chocolate chips, but you can feel free to use your favorite high-quality chocolate bars or morsels. A delicate dusting of cocoa powder over the prepared waffles adds additional color and flair. 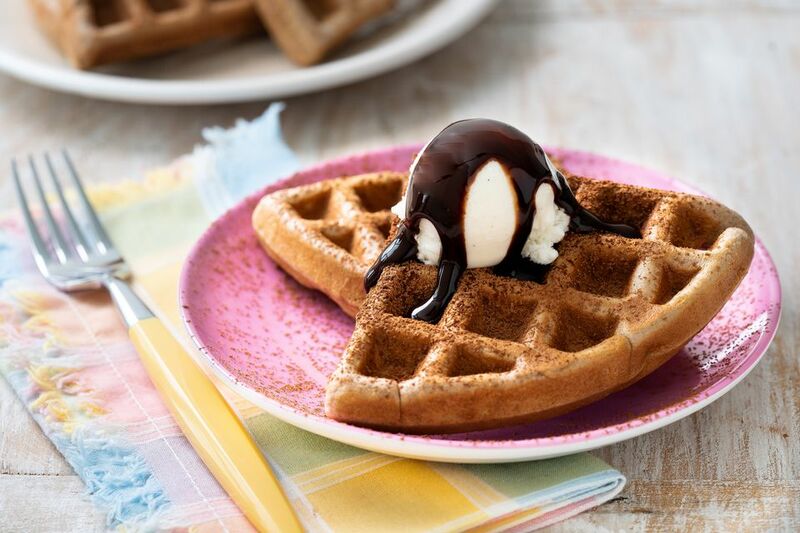 Of course, a dessert waffle dish is best served with a scoop of your favorite ice cream. Instead of a blanket of maple syrup, these waffles call for your favorite chocolate sauce to be drizzled on top. In a large bowl, combine flour, sugar, baking powder, and salt. In a separate bowl, whisk together the milk and eggs. Add the milk and egg mixture to the flour mixture; stir to combine. Melt the shortening and chocolate in a heat-safe bowl over a pot of simmering water. Alternately, the shortening and chocolate can be melted in a microwave-safe bowl in the microwave at 30 second intervals, stirring after each time. Stir chocolate mixture into the waffle batter. Preheat a waffle iron and brush with butter or coat with cooking spray to prevent sticking. Spoon the batter into hot waffle iron and spread out toward edges. Close the lid and cook until the waffles have reached desired doneness. Repeat with remaining waffle batter. Dust waffles with cocoa powder just before serving. Serve a la mode with a scoop of ice cream and a drizzle of your favorite chocolate sauce. If you are serving a crowd, it is easy to keep the first waffles warm while the other batches cook. Simply place them in a single layer on a baking sheet in a 200 F oven. They will stay just was warm and fresh from the first batch to the last. A sprinkle of toasted nuts and even a cherry on top are also exciting serving suggestions. For a party or a bigger crowd, set up a “waffle bar” and let friends and family build their own dessert waffles with all their favorite sauces and toppings. What's a Fun Way to Eat Chocolate Chip Cookie Dough? In a Dip!